Label Flow mailing address label software allows you to quickly print address labels right from your address book or spreadsheet. 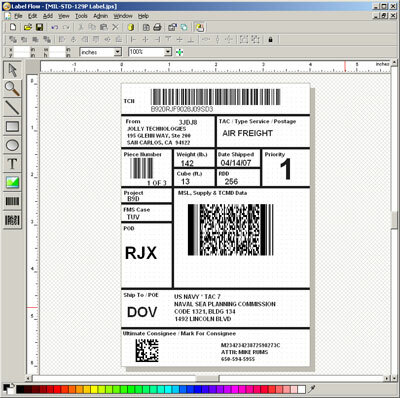 Label Flow barcode software also includes an integrated database editor and advanced data filtering tools. Label Flow mailing address label software easily interfaces with nearly all inkjet, laser, thermal and barcode label printers so you don't need to worry about device compatibility. Quickly print address labels right from your address book or spreadsheet. Label Flow mailing address label software's distinguishing features include: mail merging, interactive data feeding, serialized text, integrated database manager, advanced graphics, accelerated printing and dot matrix, inkjet, laser and thermal printer support. This is an easy-to-use WYSIWYG barcode label printing software package. Qweas is providing links to LabelFlow Mailing Address Label Software 4.3 as a courtesy, and makes no representations regarding LabelFlow Mailing Address Label Software or any other applications or any information related thereto. Any questions, complaints or claims regarding this application LabelFlow Mailing Address Label Software 4.3 must be directed to the appropriate software vendor. You may click the publisher link of LabelFlow Mailing Address Label Software on the top of this page to get more details about the vendor.